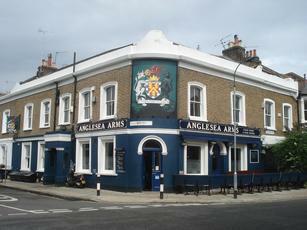 Lovely situated pub just off Goldhawk Road in easy stroll of Hammersmith. Tribute was somewhat disappointing pint no freshness or crispness. Drank very expensive Meantime IPA keg beer which was nice enough. Only 2 ales on when I went. Visited the pub early on Saturday evening whilst on the way to see a gig at the Hammy Polly. Very pleasant barman and three excellent pints of Oyster and Tickled Trout. Didn't try any of the food but well worth a visit. The ale here was excellent, had Woodforde Wherry, which was spot on, my friends reported the Sharps Cornish Coaster was excellent. This isn't a cheap place to eat but the food was sublime. Our party had a good selection from the starters and mains and they each were excellent. The accompanying wines were also very very good. We found the staff were also brilliant, great fun, humerous, even knowledgable about the 100 years war!, but notably were great with the young 'un we had with our party. I really look forward to visiting here again. Well worth a trip to find this great little pub packed with atmosphere, nice beer and great food. Food was pricey but a high standard and always busy which is a good sign. Recommended.